On 1 February 1864 John Haufler enlisted in the First Regiment of the Texas Cavalry. John lived in Kendall County and was a Union sympathizer in a Confederate state. His muster and descriptive roll dated 22 July 1864 in Brownsville states he was born in Wurttemberg, Germany and was 38 years old and a farmer. According to this muster roll, he enlisted in Kendall County for a 3 year period. How can you enlist in the Union Army if you are residing in a Confederate state? So perhaps “enlisted in Kendall County” means he was from Kendall County? The date of enlistment was 1 February 1864. John was described as blue-eyed with light hair and a fair complexion. He stood 5 feet 6 inches tall. John was a private and assigned to Company C. Adolph Zoeller, his neighbor, was the captain. 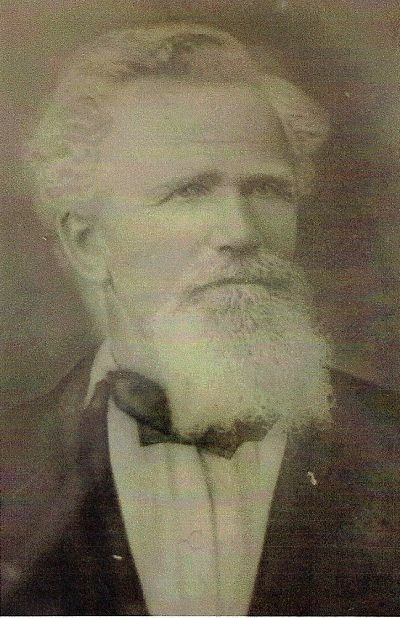 John mustered out in San Antonio 31 October 1865 and returned to his home and family in Kendall County. Because I am a descendant of John Haufler who is a Union veteran I was able to join the Daughters of Union Veterans. The Clara Barton Detached Tent #3 of DUV meets in San Antonio four times a year. If you are descendant of John Haufler, you can apply and join a DUV tent. There are always interesting speakers and a delicious lunch. Haufler, John. Photograph of the original held by Harold Haufler family. Digital copy privately held by Kathryn Adam-Hurst. Boerne. “John Haufler Civil War Union Muster Rolls Texas” Fold 3. http://www.fold3.com : 2012. Kiel, Frank Wilson. “Wir waren unser 20 Mann gegen 150” Southwestern Historical Quarterly, January, 2002, 464-470p. This weekend Comfort, Texas, is remembering Union soldiers from the Texas Hill County who died in the Battle of the Nueces on 10 August 10 1862. These men were Union sympanthizers in a Confederate State. They were on their way to Mexico and were camped beside the Nueces River when Confederate forces attacked them. On 10 August 1866 the Treue der Union Monument was erected as a memorial to these soldiers and a place for their remains to be laid to rest. It wasn’t until after the war that family members were able to make the journey to the Nueces to gather their bones and return them to the Hill Country. “NUECES, BATTLE OF THE,” Handbook of Texas Online (http://www.tshaonline.org/handbook/online/articles/qfn01), accessed August 11, 2012. Published by the Texas State Historical Association. 150th Anniversary of the Civil War Battle and Massacre at the Nueces River August 10th 1862. Commemoration Program for Events August 10th and 11th, 2012. Once the Civil War was in full swing, every male from age 18 to 45 was required to register. As the war progressed and more men left home, the Indians began to raid more frequently. In December, 1863 an act of the 10th Texas Legislature divided the state into districts and mustered men to help protect the frontier. In March of 1864, Conrad Adam was 37 years old and enlisted with the Company for the 3rd Front. The commanding officer was Capt. William E. Jones who reported to Brigadier General J. D. McAdoo. I’m not sure how much action the company saw but they were prepared. Conrad served from March 1 to June 1, 1864 for a total of 23 days. He was paid $46.00 for his service but had to pay .50 for 1 powder horn, so he actually received $45.50. At the time of enlistment, he had 1 pistol, 1 shotgun, and 1 rifle. He was listed on the muster roll as Cornelius Adam but he signed for his wages as Conrad Adam. Thank goodness, otherwise I wouldn’t have been sure it was him. Heinrich Dietert, his brother-in-law, served with him. I have often wondered if Conrad was a strong supporter of the Confederacy. Many of the Texas Hill Country Germans were very upset about being part of the Confederacy. When they arrived in Texas it was part of the United States and that’s where their loyalty lay. The area was in turmoil for a number of years with the lynching of German Union supporters in Fredericksburg and a massacre of Union German men from Comfort. It seems Conrad’s focus was in protecting his friends, family, and home from the raiding bands of Indians, so I guess I have my answer. Conrad’s picture was taken well after the Civil War, but I just love those wide lapels. Reminds me of the 1970s, don’t you think? “Kendall County Muster Roll February 1864.” Confederate Card File. The Archives Library, Texas State Library, Austin, Texas.